When it comes to my skincare, once I get comfortable with my routine I tend to not change it up too much. Repetition is boring though, let's be honest so I welcomed these new products in to the daily regime with open arms..
Bobbi Brown Hydrating Eye Cream*-Don't let the lightweight feel of this eye cream put you off, it is incredibly hydrating. The area under my eyes is prone to being dry so I love how moisturising this eye cream is whilst not being overly heavy. My dark circles are less noticeable in the mornings as well. What's great about this eye cream is that you can use it underneath correctors and concealers so those apply a lot more smoothly and don't settle in any fine lines. While this may be a luxe purchase it is so worth it. I use the smallest amount per application so this pot seems like it's going to last a rather long time. Dior Creme De Rose Lip Balm, a gift-There are probably far more enticing things at the Dior counters than a pot of lip balm, but believe it or not that is often what I have been drawn to on browsing sessions. I've also looked at Baume De Rose from By Terry in Mecca but that is crazy expensive stuff. Anyway, this lip balm is very lightweight. It's not a particularly heavy formula and it feels super moisturising and smoothing on the lips. It claims to be plumping as well but to be honest I haven't noticed much of a difference in that regard. I've used this a few times now in the last week and it has been great for clearing up some dry patches on my lips. So far, so good. MV Organic Skincare Pure Jojoba*-My skin is combination so I'm often wary about applying oils to my face. I've tried a popular oil on my face before and noticed it wasn't all that effective, and the thought of cleansing balms scares me a little. This jojoba oil is designed to be used as an eye cleanser, removing all traces of eye makeup. You dampen a cotton pad slightly first then apply a few drops of this oil and gently run it over the eye area. This oil removes everything- brow products, eyeshadow, waterproof mascara, even the concealer under my eyes that I often miss! For an oil it is not overly greasy so the area around your eyes isn't left feeling oily afterwards. If you wear heavier eye makeup or waterproof mascara on a regular basis then you'll love this product. 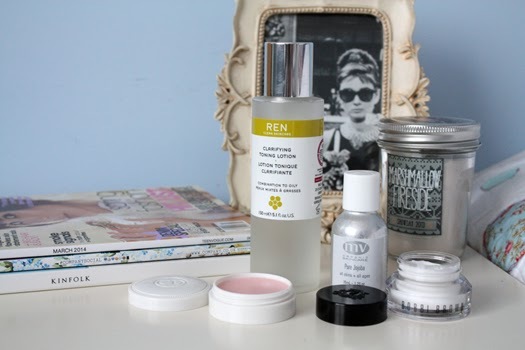 Ren Clarifying Toning Lotion, showing up as unavailable online, argh!-As far as I know this has not been discontinued, it just seems to be rather popular. This toner is gentle and lightly exfoliating which is why I picked it up. It is designed for combination to oily skin types and is said to reduce pore size and minimise oiliness. I've been using this toner for almost two months and notice my skin isn't nearly as oily as it tends to be in Summer. The shine is particularly less obvious through my t-zone which is something I've noticed through continued use. It is free of parabens, mineral oil and synthetic fragrance to name a few so it doesn't irritate my skin at all. If you've got combination or even sensitive skin then you're bound to get on with this toner. Have you tried any new skincare products lately? What have you loved? Definitely going to look into that Bobbi Brown cream! Dark circles are such a pain!